Military divorce involves many of the same issues as other divorces; child custody, alimony, and property division will all have to be resolved in the divorce proceedings. However, there are also special laws and circumstances that are unique to military divorce. If you are or your spouse is a current or former member of the military, you need a divorce lawyer who is experienced in military divorce cases. That means that an attorney who only understands Florida divorce law is simply not enough for these types of cases. 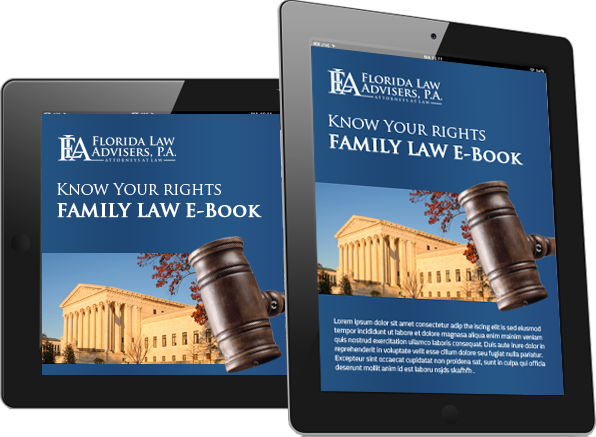 At Florida Law Advisers, P.A. our divorce attorneys have years of experience in both civilian and military divorce cases. We combine our knowledge of both military and Florida divorce law with our skills in the courtroom to provide effective legal representation. If you need help protecting your rights in a military divorce call us to schedule a free consultation with an experienced military divorce lawyer. When service members are on active duty it may be impossible for them to properly defend themselves against divorce and other family law filings. Therefore, under military law, any divorce or other family law case filed against an active service member may have to be postponed. The postponement can be for an initial period of 90 days with the possibility of extending the postponement until the service member returns from active duty. Under Florida divorce law, a civilian spouse’s right to receive a portion of the military pension in a divorce settlement does not depend on the length of the marriage. However, the length of the marriage may affect how the pension is paid to the nonmilitary spouse. Depending on the length of the marriage and other circumstances, the nonmilitary former spouse may receive his or her share directly from the government rather than from the former spouse. Retired service members may also be enrolled and have property rights in the Survivor Benefit Plan (SBP). The benefit plan is an annuity that allows retired service members to provide continued income to a named beneficiary in the event of the retiree’s death. When a service member retires, their spouse will automatically be named as the beneficiary. The service member will need to contact the Defense Finance and Accounting Service to change the named beneficiary. In some divorce cases, the final judgment will require the service member to continue to provide SBP coverage to the nonmilitary ex-spouse. However, a court-ordered settlement alone is not enough to ensure the nonmilitary ex-spouse receives the coverage. The beneficiary will have to make a “deemed election” request within the time specified. Failure to follow the strict guidelines could result in the nonmilitary spouse forfeiting his or her rights to the SBP. Our professional legal team is passionate about protecting your rights. If you are contemplating filing for divorce, or if your spouse has already filed for divorce, contact us today to schedule a free consultation with one of our divorce attorneys. Our Tampa divorce lawyers work closely with each client so that they can develop a sense of what to expect both during and after the divorce. We provide all of our clients with the individualized attention they need to make this experience as easy and smooth as possible. Regardless of whether you are filing for a contested, uncontested, or collaborative divorce, we can help.